LOS ANGELES, CA: Julian Construction (julianconstruction.com), a foundation repair and general contractor company, is working to raise awareness and activity on earthquake preparedness in Southern California. The company has spoken many times on the effects of earthquake activity on a home’s foundation and how to prevent damage in a home. 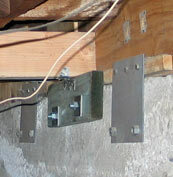 A specialty of the company is earthquake retrofitting, also known as seismic retrofitting, which reinforces a home’s foundation to resist the pressures of seismic activity. Julian Construction has over 10 years of experience in foundation construction and repair.